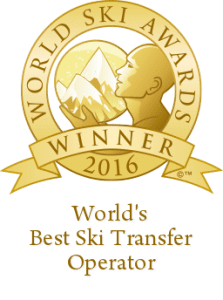 Ski-Lifts are delighted to announce that we have for the second year running collected the award for the World’s Best Ski Transfer Operator, at the World Ski Awards. These awards are voted for by members of the public and from industry insiders, so it really means a lot to us to have won this award. To get this kind of industry recognition is absolutely fantastic. Twice in a row is mind boggling, but it’s testament to all of the hard work put in over the years by the guys at Ski-Lifts HQ in Morzine. Our business has grown over the years, adapting to a changing market, changes have been made, ….and made again until the services we can offer are as comprehensive as you will find anywhere in the ski industry. We would like to take the opportunity to thank all of our loyal customers and clients for their ongoing support over the years, without your loyalty and you guys challenging us, perhaps we wouldn’t have developed the solutions which make us the best at what we do. As with any tourism related business, and particularly at Ski-Lifts, we would be nothing without the people who continue to choose to use us winter in winter out so thank you all very much. An added bonus to the award was being invited over to Kitzbuhel for the ceremony over the weekend. We had a nice ( if a little on the whiteout side ) ski, followed by lunch at the top of the Streif where we were so lucky to be joined by 1950 Hahnenkamm winner Fritz Huber. After that it was into the penguin suits and cocktail dresses for the gala dinner and ceremony. The rest as they say is…..( well it’s a little hazy to be honest, there was food, a trophy, plenty of fine wine, a speech and not a small amount of schnapps! )…..History. Sore heads nursed, award safely on the mantelpiece in the office and back to work for us. The winter season is upon us and we have a lot of work to do to make sure we live up to our reputation.